It's 8:08am, August 8th, 1988 (do you see a pattern emerging?) and Dr.H8 is doing his very best to wipe mankind off the face of the Earth. Unless, of course, you pay $88 octillion in less than 88 minutes. Short on change? Don't worry. You have 88 Heroes (and 10 of their buddies) to help you infiltrate Dr. H8's lair before time is up. They might not be the brightest or strongest heroes, but they each of their advantages. With their help, your goal is to pass each level in under 88 seconds in order to save the rest of the planet from extinction. The 98 Heroes Edition adds 10 new heroes, including Rusty from SteamWorld Dig, which brings the total from 88 to 98. This edition also tacks on an additional 8 hard levels. 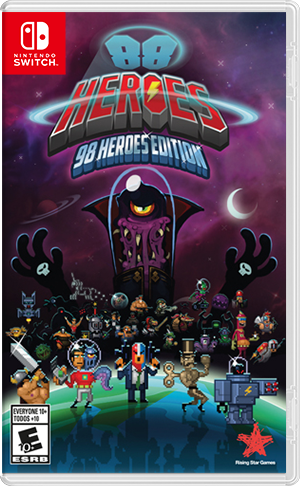 Where can I buy 88 Heroes - 98 Heroes Edition physical/digital?